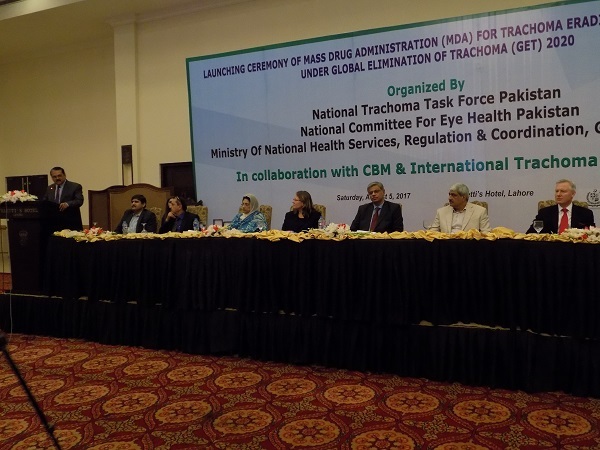 A new project to stop the spread of the painful, blinding eye-infection trachoma was launched in Pakistan this week. CBM will train and support over 3000 community health workers to distribute trachoma medication directly to people’s homes. Because trachoma is highly infectious, easily passed between family members through physical contact, it is vital that whole communities are treated together to prevent re-infection. Training of health workers will start quickly so that the distribution of medication in Chitral district (KPK province) can start quickly before the winter weather begins, making travel to the many remote communities in this mountainous region very challenging. In Chitral, with its difficult terrain and dispersed population, CBM will fund the distribution of medication for three years. The other targeted district is Kambar Shahdadkot (Sindh province), where it is expected that after one year of Mass Drug Administration (MDA), trachoma will no longer be considered a public health problem. CBM is working closely with the Pakistan Government and other partners to eliminate trachoma in the country. Speaking at the launch, Babar Qureshi, CBM’s International Director for Inclusive Eye Health, expressed CBM’s commitment to stand with the Government of Pakistan in its efforts to tackle trachoma until the disease is eliminated. This week CBM specialists are part of a group working to refine Pakistan’s Trachoma Action Plan, which aims to implement the SAFE strategy (Surgery, Antibiotics, Face-washing, Environmental improvements) in all districts where trachoma is prevalent. CBM is committed to ensuring that eye health programmes reach everyone who needs them, including groups that often miss out such as women or people with disabilities. This is particularly important as it is the poorest in society who are most likely to get infections like trachoma. Farrah Naz, CBM’s Country Representative in Pakistan, explained how the programme was involving disabled people’s organisations to make sure that people with disabilities were not excluded from the distribution of medication.